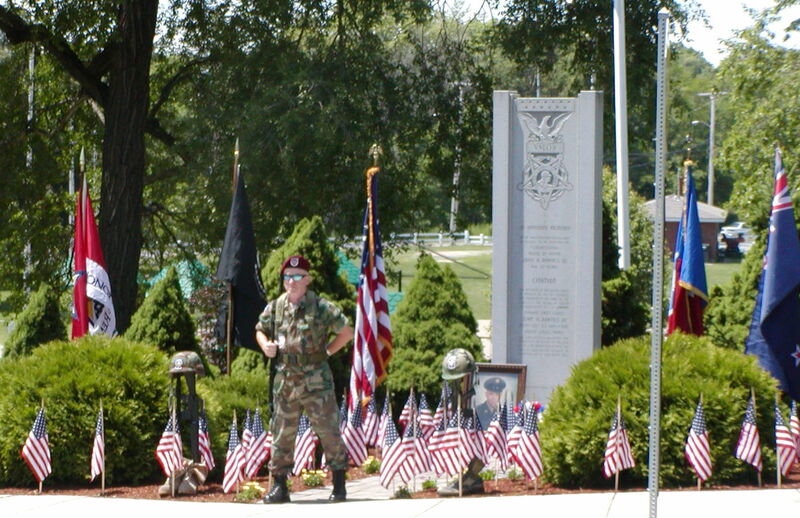 A member of the 173rd Airborne Infantry Association keeps vigil at the John Barnes Memorial on May 30, 2010. 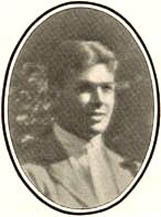 John A. Barnes III grew up in the Greenlodge section of Dedham and graduated from Dedham High School in 1964. After graduating, he enlisted in the Army and trained at Fort Benning, Georgia before serving a one year tour of duty in Vietnam, where he was awarded the Bronze star, the Purple Heart and several other medals for valor. Barnes began a second tour of duty in the fall of 1967 in the active central highlands, where he was a grenadier with the 503d Infantry. On November 19, Barnes and his unit came under attack by a battalion of North Vietnamese. When an American machine gun crew was killed, Barnes quickly manned the gun himself, killing nine enemy soldiers while under heavy attack. As he paused to reload, Private Barnes saw a hand grenade land directly in the midst of a group of wounded Americans. In an act of extreme bravery and selflessness, Barnes threw himself on the grenade just before it exploded, saving his fellow soldiers. Pfc. Barnes’ extraordinary heroism, and intrepidity at the cost of his life, above and beyond the call of duty, are in the highest traditions of military service and reflect great credit upon himself, his unit, and the U.S. Army. On April 19, 1970, Memorial Field was rededicated as John A Barnes III Memorial Park. An impressive gathering of dignitaries, V.F.W. members from dozens of towns, and local marching bands processed to the corner of East Street and Eastern Ave., where a marble monument was unveiled. Congressman James A. Burke was one of several speakers who spoke of Barnes’ heroism. Farnsworth’s last letter home was dated September 16. On September 28, he was killed while fighting in the trenches outside of Champagne. Many of his fellow Legionnaires spoke of Henry Farnsworth’s remarkable spirit and bravery. His letters were later published by his father and can be found on Googlebooks. 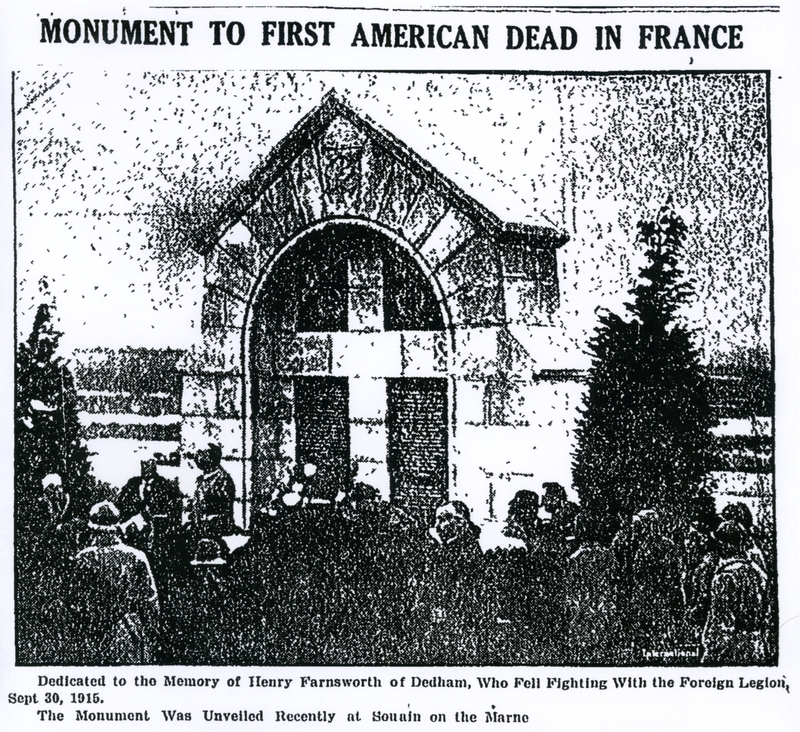 In 1920, an elaborate monument was dedicated to the memory of Farnsworth and 130 other foreign Legionnaires killed in the Battle of Champagne. The monument was paid for by the Farnsworth family. This entry was posted on May 31, 2010 at 8:11 am and is filed under History/Mystery. You can subscribe via RSS 2.0 feed to this post's comments. You can comment below, or link to this permanent URL from your own site. john a. barnes III lived on the lower part of colwell drive, a few houses in from greenlodge street. many years ago i visited the vietnam war memorial in DC and did a rubbing of his name. the same house was later the residence of walter and leo metcalf. sometime in the early 80s, walter and leo metcalf were the only people killed in a plane crash at logan airport. the plane skidded off the runway and broke apart at the first class section, where the metcalfs were sitting. if memory serves it was the elder metcalf’s birthday and his son asked if they could be upgraded to first class since his father had never flown first class. the airline -delta, i think- was happy to accommodate him and metcalf and his son disappeared into boston harbor and were never found. i had a conversation about this accident in 2001, not long after 9/11, with then-state rep. reed hillman. a former colonel of the mass. state police -and future GOP lt. gov. nominee- hillman had vivid memories of responding to the crash, which occurred when he was a trooper stationed at logan airport. Potential stories for the Haunted Peanut Butter Valley Tour- they had a ceremony at the Barnes Memorial on Sunday presenting a new Medal of Honor flag. A little off topic, but I would be interested in any history regarding the home you are speaking about if indeed it is the same as my grandfather Walter Metcalf, and my uncle Leo Metcalf, who I am named for. I would also be interested in any information regarding the accident where the two men lost their lives as I have little information on the matter. Thanks. The connection between John Barnes and the Metcalfs and the house on Colwell Dr. was made by a friend of mine in a comment on the post. I don’t really know much about that aspect of the story- the story of the World Airways crash can be found in the microfilm files of the Dedham Transcript at the Dedham library, and in the digitized Boston Globe files, which you can access at the Boston Public library or at home if you get a Boston Public Library digital card. Good luck! My brother was in the first row with them. Realized his seat was under water and struggled to remove his seat belt. He was able to climb back into the fuselage. Sad for your loss, but grateful that my brother survived. He was 18 at the time. Said your grandfather was in a wheelchair. Just to add some more thoughts of John A Barnes III, my brother William C Brobst Jr graduated with John in 1964 from Dedham HS. All 3 of us John, Billy and myself (Ronald Brobst) were also members of the Civil Air Patrol in high school for awhile and did training at the So. Weymouth Naval Air Station. John will always be remembered in our hearts..